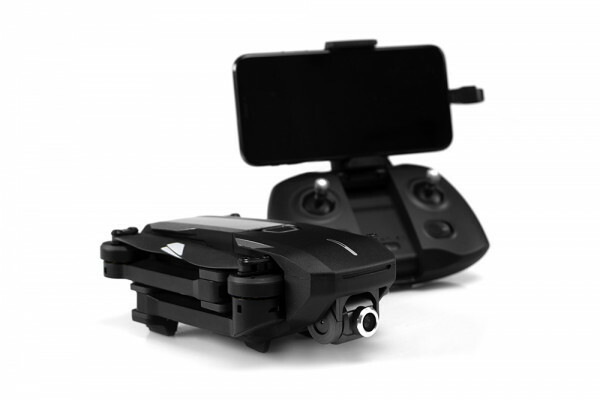 Mantis Q – the foldable and convenient travel drone for small and big adventures alike. It listens to you thanks to voice control, and the visual tracking will let it follow you wherever you go. Whether you’re backpacking in Thailand, on a road trip through the South or with your family at the beach, Mantis Q’s energy-efficient design keeps in the air for up to 33 minutes and provides you with extraordinary photos and video clips from above. Whether you travel the world in a camper or make the Mantis your daily companion, the Instant Sharing function allows you to post your photos and videos directly from the app to social media so that your friends can get a glimpse into your adventures. Just smile at your drone if you like –if activated, the face recognition let it take a picture of you as soon as it “sees” your face in a distance of up to 4m. The Mantis takes pictures with a resolution of 4800×2700 (16:9) or 4160x3120 (4:3) pixels in JPEG or DNG format (for later editing) and saves them on the included MicroSD card; the same goes for the up to in 4K recorded videos. Videos up to 1920x1080 (1080P) are electronically and live stabilized over all three axes. The integrated camera can be tilted up to 20° upwards and 90° downwards during flight. For cinematic camera flights, we also equipped the Mantis with automatic flight modes such as Journey or Point of Interest. Journey Mode - Depending on the desired setting, the Mantis Q will fly upwards on a linear path and then return automatically – making for the perfect shot. Point of Interest - Select an object while in POI (Point of Interest) mode and the YUNEEC Mantis Q will circle this object automatically. Return Home - With a push of a button, the Mantis Q will automatically return to a point near takeoff area and land by your side. The Mantis flight controller is based on the familiar open source project PX4 which is known for being extremely stable and reliable. No video, photo or telemetry data is transferred unintentionally to any external server. The included controller allows a control distance of up to 1.5 km (FCC standard, FC: 800m). The drone maintains its position and altitude independently and can be intuitively controlled without prior training. All settings and software updates are carried out via your smartphone’s touchscreen. If you want to limit the Mantis Q’s radius of action, you can easily do this with a virtual fence: and at the push of a button, you let the drone return to the launch point and then land automatically. You can check the current location of the drone at any time via a map displayed in the app (map download requires an Internet connection). Its favorite environment is open terrain - however, thanks to IPS and ultrasonic sensors, the Mantis Q can be flown safely and stably at speeds of up to 15 km/h in indoor environments where neither GPS nor GLONASS satellites are available for positioning. The drone not only brings back beautiful memories – it’s also a lot of fun! In Sport mode, the drone can reach top speeds of 72 km/h all while flying with the agility of a real racer. The live image can be viewed with a latency of less than 200 ms on your smartphone, which is connected to the remote control. Which smartphones work with the Mantis Q? Android: We recommend an Android phone with at least 4 processor cores (quad core) and a minimum speed of 2 GHz. Slower phones may experience limitations in advanced features that rely on processor performance (for example visual tracking, gesture control, face recognition). Phones with processor speeds below 1.4 GHz are not suitable for the secure operation of the Mantis Q. Which operating system is required for the YuneecPilot app?